A 2016 study done by WalletHub ranked Minnesota last for progress with regards to racial equity the condition that would be achieved if one's racial identity no longer predicted, in a statistical sense, how one fares. When we use the term, we are thinking about racial equity as one part of racial justice, and thus we also include work to address root causes of inequities not just their manifestation. This includes elimination of policies, practices, attitudes and cultural messages that reinforce differential outcomes by race or fail to eliminate them. This means that Minnesotans of color are significantly more disadvantaged in comparison to white Minnesotans, and the gap is worse than in any other state in the U.S. In response to this disparity, Minnesota has become a location of powerful people-of-color-led grassroots organizing that is working to reform a broken, unjust system of democracy. 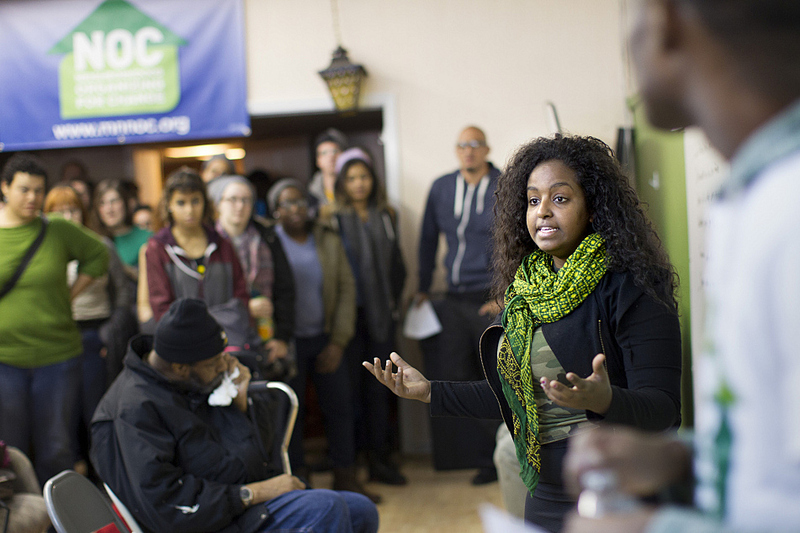 Neighborhoods Organizing for Change (NOC) is a grassroots, Black-led organization working toward racial and economic justice for communities of color in the Twin Cities. NOC is an example of the way grassroots organizing can hugely shift the political landscape for disenfranchised communities. Due largely to the hard work done by their organization, the 2014 midterm election saw an increase in voter turnout in North Minneapolis (Ward 5) by 6.5%, despite an overall decrease in voter turnout across the state as a whole. NOC approaches voter engagement with an in-depth, year-round strategy. Instead of waiting until election season approaches to begin door-knocking, its canvassers speak with members of the community all year to ensure they are continuously engaged in the democratic process and knowledgeable about their right to a political voice. NOC is also involved in Restore the Vote - a coalition of groups working to end felon disenfranchisement. Together with Black Lives Matter and other Black and primarily young people led organizations, groups like NOC are changing the conversation on the local and national level. From protests at malls, freeways and police precincts, to persistent messaging through social media and on college campuses, mainstream America is in a different place today than it was even a year ago. It’s clear that we have a long way to go, but the conversation is shifting and it’s no longer acceptable for public figures to ignore these issues. The shift has made it’s way all the way up to the 2016 Presidential Candidates, where some have adopted racial equity platforms as a direct result of pressure by groups like NOC and Black Lives Matter. Wintana Melekin, NOC’s Civic and Political Engagement Director, is one of the leaders working to advance the organization’s goals. Watch the videos above to hear her speak more about their voter engagement processes and some of the harassment and discrimination NOC members have faced while reaching out to communities of color.